Take your grilling skills up a grade. This July 2019, a master of barbecue returns to lead summer school in our ranch-side outdoor classroom. Chef Sam Huff of Sam’s BBQ-1, who is widely recognized as an elite BBQ expert, will lead three mouthwatering days filled with cooking demonstrations and opportunities for hands-on learning. Join him and rest assured, you’ll have tangy sauce up to your elbows. 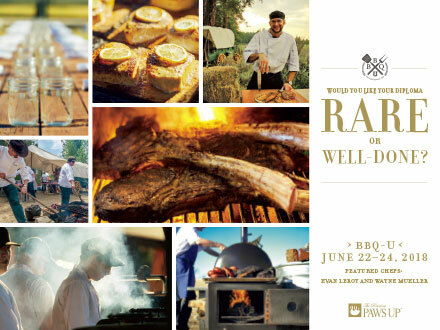 The only course requirements are to enjoy a daily regimen of eating the country’s best BBQ and sides, drinking craft beers and beverages, listening to live music and taking part in lawn games and wilderness adventures (and sleeping it all off in your own deluxe accommodations). You bet spots tend to fill up, so be sure to enroll in BBQ-U early. Ah, the sweet smells of a Montana spring, aka meat on the grill. Turn the Long Table Into the Perfect Long Weekend.